Pretty much everyone loves receiving gifts. When you’re a child, a brightly wrapped box and a shiny bow is the stuff of great childhood memories. And as we get older, we often find that gift giving is nearly as enjoyable as the receiving, perhaps because it’s just as gratifying to bestow that delight. In our professional life, the gifts we receive early in our career include getting hired, receiving a raise or earning a promotion. And as we gain seniority, it’s often a pleasure to give those opportunities to someone else. To be fair, we tend to feel – if we have even a whisper of healthy ego — that we earned those professional milestones. Still, it’s quite typical, even more polite, to say we were given a raise rather than we earned one. And we almost always say that we gave someone a promotion. Yes, yes, they earned it, but still, we gave it – blame it on that pesky ego. And of course, both things are true, really — we have to perform well, and the promotion has to be given to us. Giving a gift is symbolic, an expression of affection, or gratitude, or commemoration. The importance of the gift is that symbolism, not the perfect execution. Many a Father’s Day or wedding anniversary has relied heavily on the adage, “it’s the thought that counts”. The ideology of an old phrase — coupled with that modern practicality of the gift receipt – responsibly limits the consequences at both ends of the transaction. But promotions are tricky things. The recipient almost never worries that it won’t fit or doesn’t suit their personality. And yet, sometimes the result is just that. There are responsibilities or expectations that don’t align with the employee’s strengths. Failure to thrive in a new role can even lead to termination – a worse outcome than no promotion in the first place. Imagine receiving a gift, and six to twelve months later, getting a bill for it. That bankrupts you. And as a manager, you’re likely to wonder about your own culpability – you’ve promoted a star employee . . . who now may be fired. A promotion generally comes with a no returns policy. But perhaps there ought to be. What about a return policy . . . reinstating the employee in their prior role? Is termination the only option? Or even the best one? Why demotion is worth it: the company perspective. The cost of replacing someone can be as much as 213% of current salary. In addition, the current employee has institutional knowledge, with regard to not only skill set, but also corporate values, colleagues’ work styles, and learned efficiencies. All of this “tacit knowledge” is lost with termination. Even if a new hire turns out to be ultimately a good fit, no one new to an organisation can produce from day one. That ramp-up period is, comparatively, a cost in terms of productivity. And terminations usually also correlate with lowered overall morale amongst those who remain. Why demotion is worth it: the employee perspective. No one wants to give a present back. So there is no way round the fact that a conversation about demotion will not be enjoyable for either side. But assuming that ongoing underperformance has been properly communicated then this conversation won’t be a shock. Any self-aware employee in the situation will have at least considered the possibility of being sacked. And they may be quite receptive to going back to doing something they know they do well, especially if the new role contained a core competency they discovered they don’t possess or that de-motivates them. For example, a great salesperson who regularly beat their targets might be promoted to manager, but then struggle with budget management or mentoring. The organisation has taken somebody with a strength in sales and, in trying to reward the individual, has pushed them into a zone outside of their strengths. We could joke this is just an inevitable path toward The Peter Principle, (we all risk being promoted “to the point of our incompetence”). But that doesn’t mean we can’t demote back to the actual competence, and then find a way to recognize performance and can keep the person doing something aligned to their strengths. When is going backwards the best way forward? 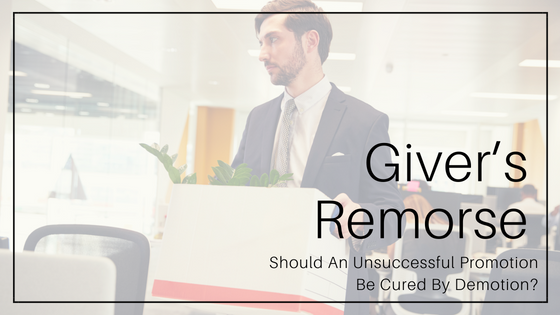 Even if the company and the employee are willing to consider a demotion in principle, there are practical considerations. Is the old role, or a similar one, available? How will any compensation increase from the promotion be adjusted (including salary, bonus, equity, holiday or other benefits)? What is the best way to communicate this to relevant stakeholders? And how will the vacancy created by the demotion be managed? Like a policy around store returns, the decision to offer demotions should come from a position of optimism and growth. Not crisis management. The point of gift receipts is not the hope that everyone wants a store credit. But that customers will be more likely to shop at a place where well-intended mistakes are tolerated. An organisation must view demotions as part of a larger philosophy of commitment to development and retention of employees. Demotions should signal a well-intended but unsuccessful endeavor of both the organisation and the employee. It isn’t simply the thought that counts, but the actions that follow, which will ultimately matter.